The personal finance sphere has taken Bach's idea and run with it. In fact, you can't swing a bag of artisan coffee on the internet without hitting an editorial, think piece, or other article explaining how the latte factor is costing you your future. But giving up your daily coffee will not mean the difference between enjoying a comfortable retirement and working until you're 80. There is a lot more going on than just the fact that $5 per day adds up to a great deal of money per year. Here's what most latte factor articles fail to take into account. While David Bach's original intent with the latte factor was to empower consumers to make more mindful choices with their money, his idea has often been used to shame people for their financial choices. Shaming is an unproductive way to motivate a person because it generally backfires. The constant drumbeat of the latte factor can make it sound like the only way to save for retirement (or any other big investment) is to give up daily luxuries. Individuals who feel guilty about their latte habit might decide that it's not worth trying to save for retirement if it means giving up their favorite luxury. The fact of the matter is that people can save money for their futures while also enjoying a daily latte. But the use of shaming language about having little luxuries can make it sound like these financial priorities are mutually exclusive. The latte factor math is unassailable. If you purchase a $5 latte every work day for 50 weeks out of each year, that adds up to $1,250 — which could certainly be a nice addition to your retirement account. The problem is that the latte factor math assumes that you can keep track of the daily $5 that you are spending. Most people's brains don't work like that. A cognitive bias known as the denomination effect makes people less likely to spend big bills compared to small ones. Five dollar bills can be quite difficult to hold onto, because they seem to be worth so little — even though the end result of $1,250 is quite big. Adding up those unspent five-spots to put them into a retirement account requires a certain type of money psychology that is exceedingly rare. For most people, refraining from buying a $5 coffee would just mean you spend the money on something else, rather than putting it aside for retirement savings. People who actually spend $5 every single day on coffee are probably not paying close attention to where any of their money goes. If you are spending money every day on a small luxury, you are probably also spending money regularly on big luxuries — and those are a great deal easier to cut out than the small ones. Rather than focus on the difficult-to-track $5 holes in your budget, start with ways to reduce the bigger line items in your budget. Are you overspending on housing, food, transportation, entertainment, or utilities? Making a cut in one of those areas will not require you to keep track of small amounts of money to see a big difference, which make them a much smarter place to find extra funds to send to your retirement account. Even if you are a generally frugal person, you don't need to ax your beloved small luxuries to find extra money in your budget. Instead, spend some time thinking about which purchases and experiences are the most enjoyable or meaningful for you. Deciding what you want to spend your money on makes it easier to let go of the spending that doesn't matter as much to you. You'll enjoy your spending more that way, while still having savings to send to your retirement accounts. One aspect of David Bach's advice that often gets lost in discussions of the latte factor is the importance of automating. Bach suggests cutting out your daily indulgence and setting up an automatic transfer of the savings to your retirement or savings account — which would solve the whole problem of trying to keep track of those saved $5 bills. However, you don't need to give up your daily luxuries to be able to harness the power of automation. Once you have identified any spending items you're willing to cut, funnel the savings into your retirement account. If a daily latte is your favorite part of your morning ritual, then feel free to keep it and cut something else to automate that savings. Living on a shoestring is exceedingly difficult. You have to say no to yourself constantly, which can lead to something called the "what the hell" effect. This effect describes how we tend to believe that refraining from spending money is an all or nothing proposition, so the moment we give in to temptation a little bit, we might as well throw our own guidelines out the window: "What the hell, I've already bought myself a latte, I might as well go buy some new shoes!" It's easier to go the distance while saving for retirement if you let yourself have some indulgences. You will no longer feel like the slog to retirement is going to be a daily misery that you might as well rebel against. Instead, your daily latte can make any other sacrifices easier to bear, and help you adjust to a new savings normal. Cutting out the latte on top of anything else can trigger the "what the hell" effect and make it even harder for you to save. 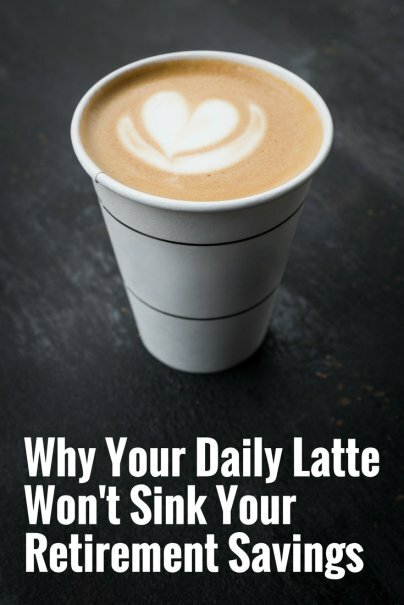 The latte factor is an important thought exercise, but it should never become a hard-and-fast rule for how to live your life. Building daily luxuries into your life is an important part of enjoying your time, both during your career and after you retire. As long as you are willing to be mindful about your spending in general, you don't need to sacrifice small pleasures to afford retirement.